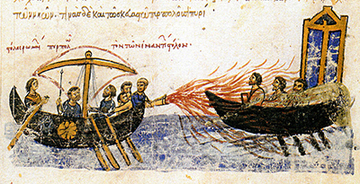 Greek fire, which is also called marine fire or by its latin name, ignis graecus, was a incendiary weapon of the Byzantine Empire that was developed in the late 7th century AD. It was launched from a catapult and its main attribute was that it was not extinguished by water. As a result, it contributed significantly in the repelling of the Arab naval and land attacks against Constantinople. Its creation was covered in secrecy, and therefore, we do not know its exact composition. Various incendiary substances were used before the invention of Greek fire; Thucydides even mentions the usage of flame throwers during the siege of Delio in 424 BC. According to Theophanes, Greek fire was invented around 672 BC by an engineer called Callinicus, from Heliopolis, Syria (modern Baalbek), who had sought refuge in the Byzantine capital. However, Theophanes’ description may not be correct, as he described the existence of flame – bearing ships a few years before Callinicus’ arrival to the city. This may mean that Callinicus simply introduced an improved version of an existing weapon. On the other hand, historian James R. Partington believes that the Greek fire was invented by a group of chemists in Constantinople who had mastered the discoveries of the Alexandrian Chemistry School. In any case, the invention of the Greek fire came during a critical period for Byzantium; weakened by the Sassanids after decades of war, the Byzantines would never manage to repel the newly arrived Arabs, who had already conquered Syria, Egypt and Mesopotamia. So, during the attacks of the Arabs against Constantinople, the Byzantines used the weapon with miraculous results. As already mentioned, the composition and the procedure for creating Greek fire were tightly held secrets. As a result, these secrets have been lost and various theories have emerged as to how it was produced. It should be mentioned, though, that Greek fire was a full weapon system, consisting of various parts, which were all necessary for its effectiveness; apart from the incendiary substance, the system also included the dromones, an apparatus for heating and pressurizing the substance, the launch siphon and the specialized education of the operators. In fact, each operator probably knew a very specific function of the system, so that the secret would never be found even if one of the operators was held hostage. This is why when the Bulgarians conquered two cities in 814 AD, they were unable to use Greek fire even though they had found huge quantities of the substance.